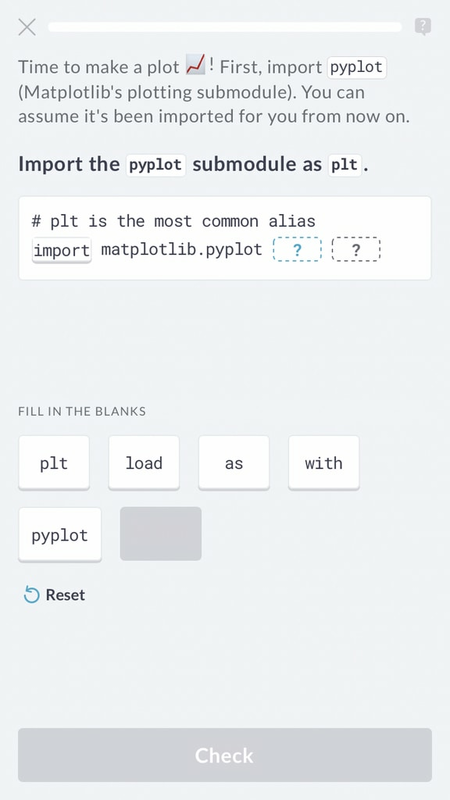 Master data science on the go with DataCamp Mobile, a Duolinguo-style app, which offers bite-sized lessons you can complete in 5 minutes or less! Data science is the future, but learning it takes a lot of time. Time you don't have? Wrong. With DataCamp for Mobile, you master data science while on the train or on the bus (or on the toilet, as we'll explain). You don't have to be a math genius either. DataCamp's Learning by Doing methodology makes learning it intuitive for everyone. At DataCamp, we're dedicated to bringing you the best possible learning experience for data science. At the core, there are our 100+ intuitive web courses teaching the fundamentals of R, Python, and SQL as well as more advanced topics like Machine Learning and Deep Learning. Furthermore, to attain true proficiency, our Practice Mode lets you train what you've learned before, and with Projects you get hands-on experience solving real-world problems. However, a big problem for many of our users is finding the time to learn and practice. That's why we wanted to make a version of DataCamp that better fits a busy schedule. But how? The answer is simple: better use the time that is otherwise lost. Did you know you spend 20 hours per year on the toilet? That's more time than you need to complete our Python Programming skill track! Did you know you spend 20 hours per year on the toilet? That's more time than you need to complete our Python Programming skill track! 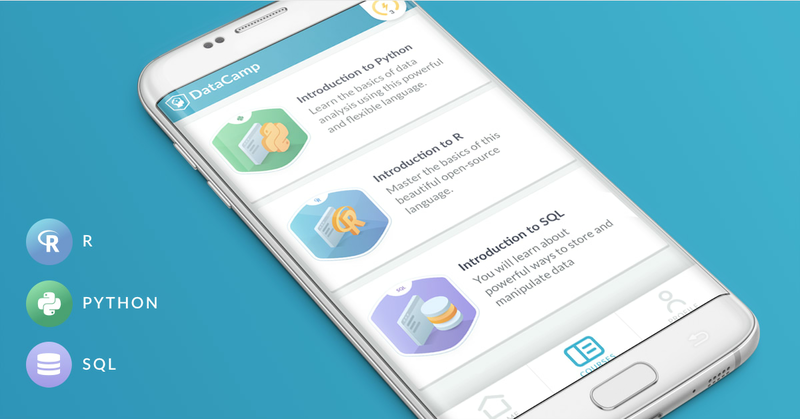 DataCamp for Mobile (available in the Apple App Store and Google Play Store) offers courses on Python, R and SQL that help you master the practical skill set to do data science. Taught in a Duolingo-style way, you'll still learn the same concepts as you would in our web courses. It also contains a practice mode to train what you learned before. Courses are divided into 5 minute lessons that teach you one concept at a time. 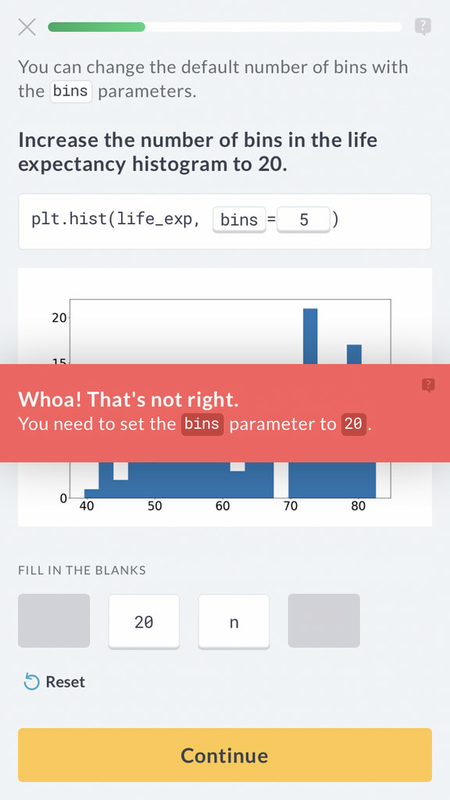 Each lesson gently introduces data science concepts without making you read tons of text. Instead, all material is presented as an exercise. Starting from zero, each exercise builds on the next to break down even the most complex data science concepts in understandable pieces. This learning by doing methodology is the core of the DataCamp experience and the foundation of its success. Starting from zero, each exercise builds on the next to break down even the most complex data science concepts in understandable pieces. This learning by doing methodology is the core of the DataCamp experience and the foundation of its success. Our users seem to like it so far: the app was downloaded almost 100.000 times in only a few weeks, and the average app store rating is 4.5/5. There are two main challenges when teaching on mobile: the small screen size and the limited attention span of mobile users compared to web users. That's why there is only one way to make the mobile app successful: creating a learning experience that is as engaging as possible. To make the learning experience as engaging as possible, we want to bring you into the "learning flow". Whenever you start a lesson, every element on the screen is focused on either teaching or motivating you about the progress you've made. All elements on the screen have a fixed location: first a little explanatory text, then the question, then the answer options and finally the check button. The text has the size of a tweet so you never have to read too much. Every exercise has the same sequence of actions: read the question, solve it, hit check, absorb feedback, hit continue, repeat. By keeping this flow consistent, you get in a rhythm that brings you "in the zone". Of course, it is inevitable to make a mistake from time to time. That's why we add a personalized feedback message to explain what is wrong. Whenever you answered a question incorrectly, it will come back later in the lesson. 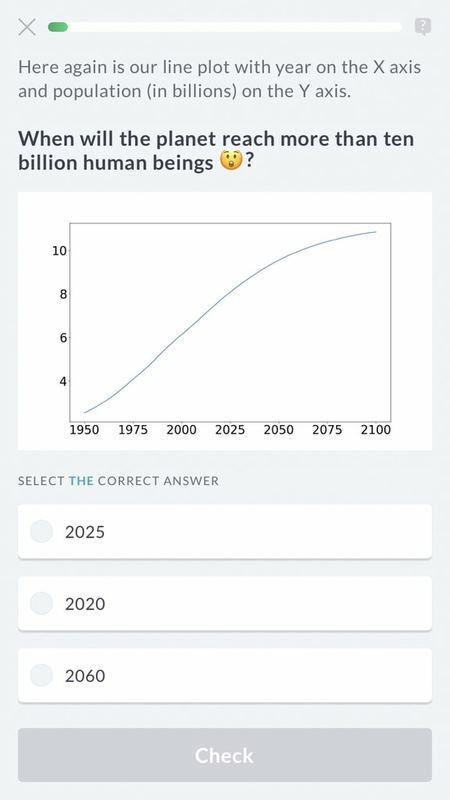 DataCamp for Mobile also offers a practice mode, which allows you to train what you've learned before. To help you get a habit of practice, we are gamifying many aspects of the app. For example, we added a daily streak indicator that shows how many days in a row you learned data science. Expect more gamification features in the near future! 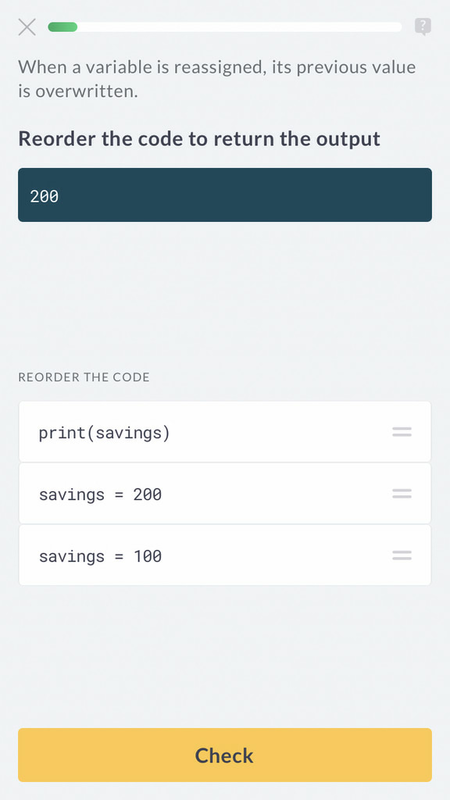 Only being a couple of months old, there are still many ways to improve DataCamp for Mobile. Add more courses. Recently, we added Intermediate Python and Introduction to SQL to the app, and many more courses are in the works. We're also reaching out to external instructors, to bring you the highest quality courses by experts in the field (if you are interested to make a course or you know someone, please don't hesitate to reach out to mobile@datacamp.com!). Bring all practice content we have on web to mobile. Practice mode already exists on web for a while, with exercises for 17 courses! Our goal is to bring all these practice exercises to mobile in the coming months. Improve the existing content and user experience. Being a data-driven company, we will do a thorough data analysis of our current content and make improvements where necessary. Also, a thorough redesign of the course navigation screens is on the roadmap. Finally, we'll be adding - much-requested - sounds for good and bad answers. Would you like to see something else? Please don't hesitate to share any feedback you have with us in the comments below or at mobile@datacamp.com! DataCamp for Mobile brings DataCamp's intuitive learning experience to become data fluent to mobile. This way, we hope to make data science education accessible to people with a busy schedule. Our users seem to like it as well! The app was downloaded almost a 100k times in just a few weeks and has an average app store rating is exceeding 4.5/5. So, next time you are swiping through Facebook or Instagram (maybe during a restroom visit? ), consider whether you don't want to open DataCamp for Mobile instead ;) Happy Learning! Are you interested in mobile or online education? Join our team! We are looking for developers and many other roles. Apply now at https://www.datacamp.com/careers.